The 3.0L V6 340HP Supercharged engine provides high performance with an immediate response even at low engine speeds. With 332 lb-ft of torque, it can accelerate the XJ from rest to 60 mph in as fast as 5.7 seconds (6.1 seconds with AWD). Available on the XJ R-Sport XJ R-Sport AWD, XJL Portfolio and XJL Portfolio AWD. The 8-speed transmission in the XJ is controlled by the beautifully designed JaguarDrive Selector™, which rises into your hand once the Start/Stop button is pressed. Simply rotate the selector to move from Park to Reverse or Drive. JaguarDrive Control™ offers specific settings for the drivetrain: Dynamic Mode, which modifies transmission shift points while illuminating the Virtual Instruments in red, or Winter Mode, providing more progressive throttle control for slippery conditions. The Active Differential in the XJ/XJL Supercharged and XJR detects wheel spin and varies the torque delivery to each rear wheel, enhancing both traction and cornering agility. This advanced all-wheel-drive system employs active power-transfer technology to continuously monitor road conditions and optimize traction and handling balance. Available on V6 Supercharged engines. 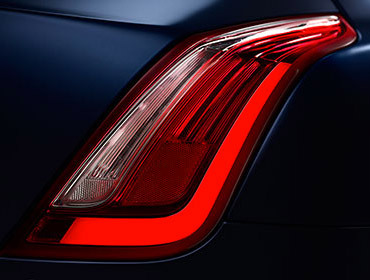 At the rear, striking new tail lamps with signature ‘J’ LED illuminated running lights and elliptical tailpipes accentuate the power and agility of the XJ. The rear screen wraps seamlessly around the XJ to create a floating roofline that emphasizes the long, low and wide profile. Inside the XJ, the impression of space is accentuated by the panoramic roof and the sweep of hand-crafted veneer that runs around the cabin. The feeling of luxury is punctuated by exciting comfort elements, and phosphor blue lighting creates an elegant finishing touch. So you never just travel in an XJ, you are transported to another place. The cabin is both contemporary and luxurious, created to excite the senses. You can personalize the interior with a choice of materials and finish to meet your exacting standards. Vast expanses of glove-soft leather and beautiful veneers give XJ its distinctive, luxurious atmosphere. (Not all colors shown are available on all models). All XJ models feature InControl Touch Pro™, a brand new, state-of-the-art infotainment system. Driven by an Intel quad core System it takes the idea of the ‘connected car’ to another level. The system seamlessly integrates with your smartphone to offer a range of services that enhance the driving experience by keeping you completely connected while you are on the move. Keep passengers entertained with dual 10.2 inch screens in the rear of the front headrests. Rear passengers can watch a DVD or streamed video via the Rear Media Interface. The system includes two WhiteFire™ digital wireless headphones. This feature is only available as part of the Premium Rear Seat Package. The Intelligent High Beam system recognizes light from other vehicles, automatically switching the full LED headlights between low and high beams as needed. Additionally, Adaptive Front Lighting works in conjunction with the steering to increase illumination on bends, making night driving less stressful. Jaguar InControl® Protect™ includes SOS Emergency Call and Optimized Roadside Assistance. In the event of a critical situation, your Jaguar vehicle can automatically notify emergency services of your location. Should you contact Jaguar Roadside Assistance, the system can provide your GPS location and relevant diagnostic information, including battery charge, fuel level and tire pressure to guide the call center and help minimize delays to your journey. Advanced Driver Assistance Systems help to maintain awareness of your surroundings on the move and reduce stress when parking. 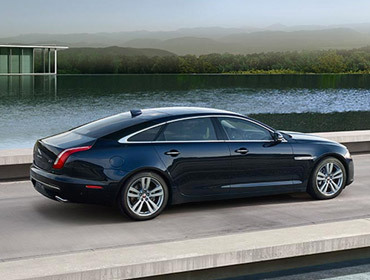 360 degree Park Distance Control is designed to alert you to the proximity of objects around XJ. For even greater reassurance, the Surround Camera System displays images on the central Touch-screen from four cameras positioned around the car.